Has casual browsing through Pinterest or Facebook ever put you in a slump, wishing your life looked more like that house, marriage, vacation, wardrobe, family, or job? You are not alone. Kay Wills Wyma’s new book I’m Happy for You (Sort Of…Not Really) is dedicated to all of us stuck struggling with “Obsessive Comparison Disorder”, trying to find contentment in the face of everyone else’s seemingly perfect lives. 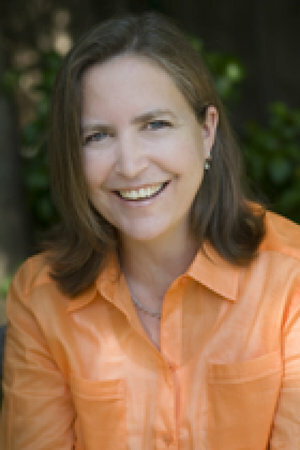 Kay Wills Wyma has five kids, ages four to fourteen, and one SUV with a lot of carpool miles. She holds a bachelor’s from Baylor University and an MIM from the American Graduate School of International Management (Thunderbird). Before transitioning to stay-at-home mom, she held positions at the White House, the Staubach Company, and Bank of America. She and her husband, Jon, live with their family in the Dallas area. You had me at “Hello”…well actually at the title of the book. 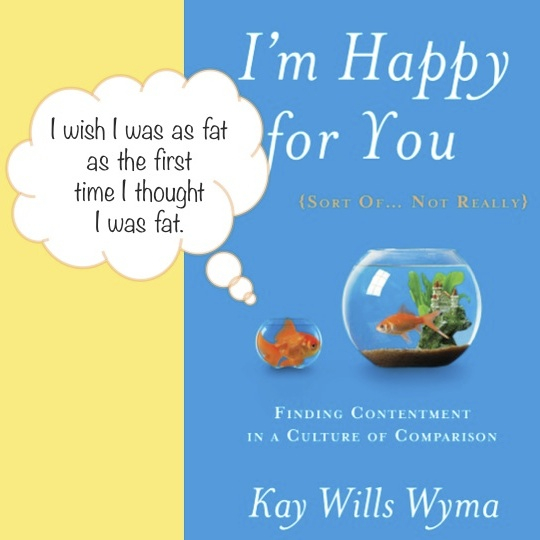 I’m Happy For You (Sort of…Not Really) by Kay Wills Wyma is AH-MAZE-ING! 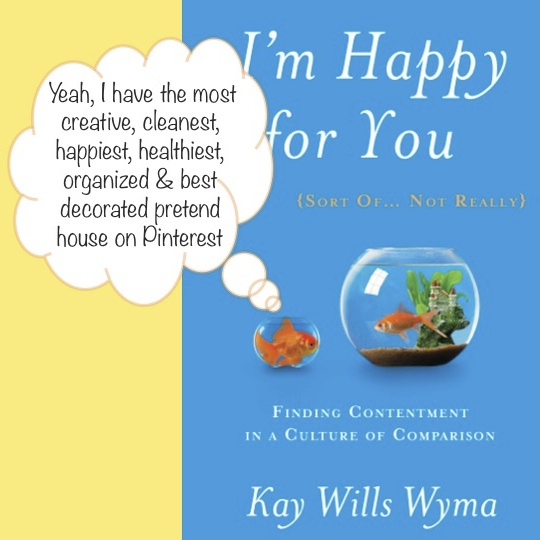 In a world where comparison and competition are epidemic…where Facebook, Pinterest and Twitter announce to the world the worthiness of each individual, Kay Willis Wyma reminds us that we can stop the craziness. Contentment is possible. I absolutely LOVED this book. Did I already say that? That’s ok, it’s worth repeating. I laughed, nodded my head in agreement (emphatically, much to the surprise of those sitting around me in the pick up lane at school) and gave several hearty AMENS. I could quote the entire book because it’s just that good but I’ll refrain and just tell you that you can and should get your own copy, because it’s worth it. I’ll make it easy for you, here’s the link. 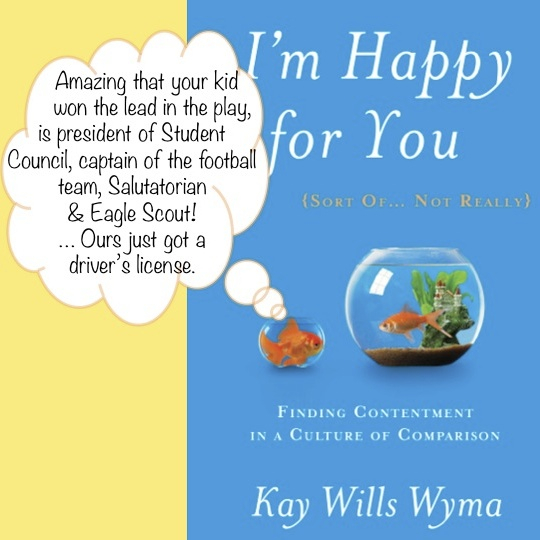 Using stories from her personal experiences and others throughout the book, Ms. Wyma provides great arguments and instruction for overcoming our cultural “Obsessive Comparison Disorder”. Overall, I’m Happy for You (Sort of…Not Really) deserves five out of five stars! I received this book from Blogging for Books for this review.